Tigard dead animal removal is one of the main services we offer and it is becoming a more common problem as wild animals are getting more use to living in town. House's are not only a great place for people to live in, but they have areas like the crawl space and attic that are perfect for wildlife to live. They provide shelter, warmth, and usually a food source which is appealing to all types of animals. These areas become even more appealing with it is time to have babies which starts early spring. This can create alot of risks for homeowners because the animals can be very aggressive and defensive around there babies. But a common mistake many people make is sealing the entry hole they find the leads under the house. This can trap the animal inside and they will either die underneath or cause alot of damage trying to get out. We are able to remove live or dead animals from under your house and seal the holes to prevent this problem from happening again. The smell of a dead animal is usually the first thing people notice when they have a dead animal problem and the odor can stay long after the dead animal has been removed. We offer professional deodorizing service with our dead animal removal. We use a food grade deodorizer and fogger, which means it is child and pet safe and can be used inside the house. This is not a cover scent, but knocked down the odor and kills the smell. We have had some customers that could smell the odor for months after the animals was removed before they decided they needed it deodorized. We always recommend deodorizing because the odor can sometimes attract other animals and pests inside your house. 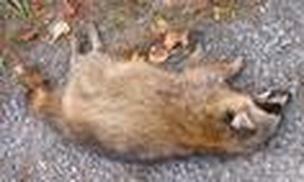 Dead Raccoon in your yard. Dead opossum under your house. Dead Rodents in your attic. Bad smell in your attic or under your house. Tigard Dead Animal Removal Call 503-201-2432!